In recent years, a medical procedure called interventional radiology (IR) has been attracting considerable attention. Doctors can perform IR percutaneously while observing the fluoroscopic image of patients. Therefore, this surgical method is less invasive. In this surgery, computed tomography (CT) equipment is often used for precise fluoroscopy. However, doctors are exposed to strong radiation from the CT equipment. In order to overcome this problem, we have developed a remote-controlled surgical assistance robot called Zerobot. In animal puncture experiment, the operation of Zerobot was based on joint control. Therefore, during a surgery, the tip of the needle moves when a surgeon orders for a change in the direction of the needle. This makes the robot less user-friendly because the surgeon tracks the trajectory of the tip of the needle. This problem can be solved by using remote center control. K. Sugiyama, T. Matsuno, T. Kamegawa, T. Hiraki, H. Nakaya, M. Nakamura, A. Yanou, and M. Minami, “Needle Tip Position Accuracy Evaluation Experiment for Puncture Robot in Remote Center Control,” J. Robot. Mechatron., Vol.28, No.6, pp. 911-920, 2016. T. Hiraki, T. Kamegawa, T. Matsuno, and S. Kanazawa, “Development of a Robot for CT Fluoroscopy-guided Intervention: Free Physicians from Radiation,” Jon J. Intervent. Radiol., Vol.20, pp. 375-381, 2014. T. Hiraki, H. Gobara, H. Mimura, S. Toyooka, H. Fujiwara, K. Yasui, Y. Sano, T. Iguchi, J. Sakurai, N. Tajiri, T. Mukai, Y. Matsui, and S. Kanazawa, “Radiofrequency Ablation of Lung Cancer at Okayama University Hospital: A Review of 10 Years of Experience,” Acta. Med., Vol.65, No.5, pp. 287-297, Okayama, 2011. D. Staianovici, K. Cleary, A. Patriciu, D. Mazilu, A. Stanimir, N. Craciunoiu, V. Watson, and L. Kavoussi, “AcuBot: A Robot for Radiological Interventions,” IEEE Trans. on Robotics and Automation, Vol.19, No.5, pp. 927-930, October 2003. B. Maurin, B. Bayle, O. Piccin, J. Gangloff, M. Mathelin, C. Doignon, P. Zanne, and A. Gangi, “A Patient-Mounted Robotic Platform for CT-Scan Guided Procedures,” IEEE Trans. on Biomedical Engineering, Vol.55, No.10, October 2008. Y. Koethe, S. Xu, G. Velusamy, B. J. Wood, and A. M. Venkatesan, “Accuracy and efficacy of percutaneous biopsy and ablation using robotic assistance under computed tomography guidance: a phantom study,” European Radiology, Vol.24, Issue 3, pp. 723-730, March 2013. S. Ikeda, C. T. Villagran, T. Fukuda, Y. Okada, F. Arai, M. Negoro, M. Hayakawa, and I. Takahashi, “Patient-Specific IVR Endovascular Simulator with Augmented Reality for Medical Training and Robot Evaluation,” J. of Robotics and Mechatronics, Vol.20, No.3, 2008. 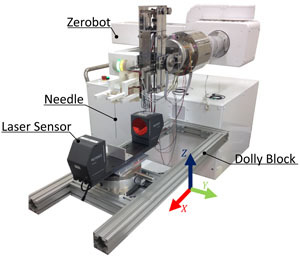 Y. Kobayashi, J. Okamoto, and M. G. Fujie, “Position Control of Needle Tip Based on Physical Properties of Liver and Force Sensor,” J. of Robotics and Mechatronics, Vol.18, No.2, pp. 167-176, 2006. H. Nakaya, T. Matsuno, T. Kamegawa, T. Hiraki, T. Inoue, A. Yanou, M. Minami, and A. Gofuku, “CT Phantom for Development of Robotic Interventional Radiology,” IEEE/SICE Int. Symposium on System Integration, Chuo University, Tokyo, Japan, December 13-15, 2014. K. Sugiyama, T. Matsuno, T. Kamegawa, T. Hiraki, H. Nakaya, A. Yanou, and M. Minami, “Reaction Force Analysis of Puncture Robot for CT-guided Interventional Radiology in Animal Experiment,” IEEE/SICE Int. Symposium on System Integration (SII), Nagoya, Japan, December 11-13, 2015. J. J. Craig, “Introduction to ROBOTICS – mechanics and control,” Addison-Wesley, 1989.